What parent hasn’t felt frustrated, tired or even confused? Suzanne Riedel explores how God helps us help our children. Hosted by our church, this talk is open to the public and all are welcome! Please join us on Sunday, February 24th, at 2:00 pm, in the Pasadena Christian Science church building. 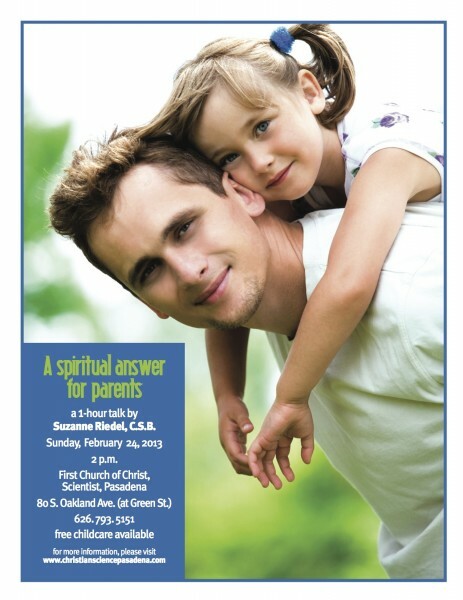 Ms. Riedel will discuss ideas on recognizing God’s presence and care in bringing answers for our children’s welfare and practicing effective prayer that results in positive parental guidance. Ms. Riedel is a national speaker who has proved these spiritual answers in her own life. A practitioner and teacher of Christian Science healing, Suzanne Riedel is a member of the Christian Science Board of Lectureship. 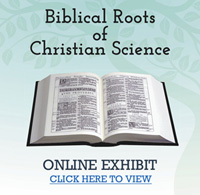 Visit our online Bible Exhibit! Wednesday Testimony Meeting 7:30 p.m. Wed 6:15 p.m. to 7:15 p.m.
Sunday 1 p.m. to 3 p.m.